Maintenance, Repair and Overhaul capabilities are a key part of the defence sector and play an especially crucial role for military aircraft. This is due to the constant need for a capable and operational military aircraft, part of any robust military force. As a result, the market outlook for this area of the defence sector is positive. 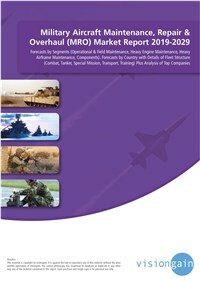 The key player assesses the market to be valued at $35.7bn in 2019 and with continued advancement and sustained market demand, the key player predicts growth for the global military MRO market.